Two of our animals went to church this morning. 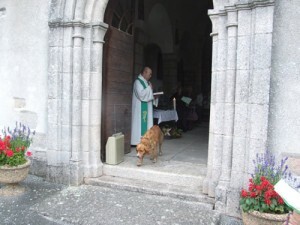 There was a special animal blessing ceremony to celebrate St Francis’s day at Nouzerines. We set off with Seamus and Brendan the alpacas, and also Archer the guinea-pig in a wastepaper basket. But we were a bit late, the alpacas weren’t in a mood to be hurried, and I’m still a bit fragile after being poorly, so we only got as far as the gate before turning back. We put the boys away, selected a baby bunny to go in another bin, and set off again in the car. We’re glad we made the effort. It was a lovely service. There were lots of dogs, a good selection of goats, including the smallest one I’ve ever seen, a handful of rabbits, one guinea pig (ours) and four horses. They were all very well behaved – noone ate anyone else – so the whole thing was a great success. Of course, everyone wanted to know where our llamas where, so we had to explain what had happened about a dozen times. The service was followed by a procession, but we didn’t join in as it was a couple of kilometres long and I wasn’t up to it. We helped ourselves to some windfall apples and walnuts on the way back to the car. What a nice morning!